Among professional epithets, few are as out of date as “bean counter.” And a quick look at today’s cadre of chief financial officers shows why. Take Connecticut-based toolmaker Stanley Black & Decker, for example, where the CFO is leading a global transformation of the company’s business analysis and reporting capabilities. He has changed the forecasting process, basing it on the drivers of sales rather than on financial trends. In addition, by taking a multi- dimensional approach to performance reporting and harnessing the power of predictive analytics, the company is creating more accurate and transparent processes. The exercise has highlighted the CFO’s skills in the change management aspect of the complex project, which involves the harmonization of about 90 separate ERP systems. Among the anticipated benefits for the company: a more diversified business portfolio and a roughly 30 percent increase in revenues by mid-decade—hardly a hill of beans. In fact, the basic task of any CFO—monitoring the financial health of the company—has always been a foundation of good business practice. And without their financial acumen, and the essential work of record keeping and reporting that they oversee, no company could meet its compliance and risk management obligations. Yet until recently, finance chiefs played only a narrow role in strategic decision making and virtually no role in business transformation. They were expected to take responsibility for the financial implications of the strategy, to be sure. But most remained almost entirely focused on their own function. No longer. The Great Recession thrust CFOs into the corporate spotlight. If companies were to survive, they would require cost management skills of the highest order. And by pursuing a disciplined drive for operational efficiency, many CFOs excelled. Indeed, the success of their financial stewardship has left company coffers flush with cash—and the robust profits that have driven stock markets to new highs. CFOs’ financial successes have also greatly enhanced their status and influence within their companies. When Accenture and Oracle recently polled more than 900 finance chiefs—a globally representative sample encompassing multiple industries (see Sidebar) —71 percent told us that they enjoy a significantly higher level of strategic influence than they did three years ago; nearly two-thirds (65 percent) said they have seen their influence over determining and setting strategy grow; and almost half (47 percent) reported that their influence on business transformation efforts has increased. At the same time, the growing importance of Big Data is playing to their sweet spot. CFOs are looking to integrate increasingly rich data about markets, sales, customers and internal operations to identify opportunities to accelerate growth and enhance profitability. Not that it’s been a smooth ride. Indeed, CFOs confront multiple challenges in fulfilling their new, strategic mission. The economic recovery remains fragile: Global GDP growth for 2013 was expected to come in at about 2.9 percent as this article was published, some 30 basis points below 2012’s performance. Cost and cash flow management to support profitability will clearly continue to be the core concern. But CEOs are also looking to take their companies to the next level of operational efficiency—a level that will boost productivity still further, as well as provide a platform for greater revenue growth. With incremental operational efficiencies becoming harder to find, business leaders expect CFOs to help them identify and manage new productivity models in a global economy of ever-deepening complexity. Expansion into emerging markets and the rapid adoption of new, digital technologies are boosting both the volume and velocity of data with which businesses must grapple. At the same time, government compliance demands are intensifying. CFOs must manage the requirements of evolving International Financial Reporting Standards, for example, as well as the cost implications of mounting pressure to meet environmental and labor obligations across multiple geographies. Accenture’s research and experience suggest that global, cross-functional integration of business support processes, enabled by innovative technologies and new operating models, can help significantly—driving productivity improvements of between 20 percent and 30 percent. And our survey shows that most CFOs recognize the value of such a transformative approach. A majority (57 percent) of respondents believe, for example, that targeted investments in digital technologies and capabilities such as Big Data and analytics will be a key source of future competitive advantage. And fully 84 percent are now collaborating with the CIO to implement these capabilities. Some, moreover, are going further still. Having distinguished themselves as innovators within their own function during the downturn, leading CFOs are now leveraging their enhanced status to do more than participate in driving the improved operational efficiencies that organizations now seek. They are actually spearheading business transformation in the manner of Stanley Black & Decker’s CFO. Consider, for example, how the CFO of Baker Hughes gained much deeper insights into the analytical value of data—not only within finance but also across the Houston-based oilfield services company’s other functions—by leveraging a combination of automation, outsourcing and analytics. Between dramatic variations in accounting processes across the 80 countries in which Baker Hughes did business and internal controls stemming from seven separate divisional audit groups, the company was missing cost synergies. In addition, effective analytic insight was all but impossible. Enter the CFO, who launched the One Baker Hughes Finance Transformation Program, an initiative designed to standardize financial accounting as well as planning and budgeting functions across the entire company. To date, the program has saved $50 million in annual labor costs, and cut finance costs by 35 percent. Perhaps most significantly, it has turned the CFO into a powerful C-suite partner with valuable insights into where to invest capital resources most effectively. The best CFOs can identify inefficiences, better judge key performance indicators and manage risk more effectively. Such CFOs have a view far beyond finance—into functional investment across marketing, sales, operations and IT, for instance. They can also identify where inefficiencies or duplications are occurring. They can better judge such critical key performance indicators as the cash conversion cycle, which measures how well a company is converting investments in products and services into cash through sales. They can pinpoint opportunities more quickly. And they can manage risk much more effectively. Typically, leading CFOs are building on their successes in the finance function to assume a more cross-functional role—collaborating with other business leaders to expand their influence in driving broader transformation of the enterprisewide operating model. At a leading global beverages company, for example, the finance chief has helped sustain an aggressive expansion into emerging markets and significant annual sales, despite the financial crisis. Now, working hand in hand with the chief marketing officer and the chief information officer, the company’s CFO is overseeing the implementation of an analytics-based initiative designed to improve forward planning processes. By leveraging advanced, online analytical tools to simplify and streamline its approach, the company aims both to increase market share and improve its margins. Meanwhile, at Boston Scientific, a Massachusetts-based medical solutions provider, the CFO has assumed a more prominent strategic role after his successful transformation of the company’s decentralized, labor-intensive finance processes. The initiative, a combined standardization and shared services (with outsourcing) exercise, has saved Boston Scientific millions in cost to serve. Now the CFO has been put in charge of a pricing transformation designed to bolster the company’s profitability—a responsibility that involves close collaboration with both IT and sales and marketing. And at a large European bank, the CFO has played a critical role in the development of an integrated architecture and processes for customer profitability, as well as for management, group and regulatory reporting. The data warehousing architecture that supports the customer profitability and reporting solutions originated in finance, and is being expanded to include business, risk and treasury data. This capability will help put the large European bank ahead of its competitors in meeting tough business, regulatory and capital adequacy requirements today and in the future. In some instances, CFOs are even leading overall business transformation initiatives. Case in point: the CFO of Galderma, the dermatological pharmaceuticals company, who has significantly improved forecasting accuracy and expanded the growth-oriented company’s planning horizon by drawing sales, manufacturing, R&D and marketing functions into an end-to-end integration of finance and performance management. A globally integrated business services infrastructure, equipped with repeatable merger integration capabilities, will help maximize those benefits. Indeed, our client work has shown us that such global shared services are essential—the key to optimizing the productivity benefits of operating model transformation. They provide a platform for end-to-end process efficiencies and economies of scale, for example. And they give an organization’s stakeholders more consistent access to a wider range of services. It’s clear that more and more organizations are moving toward such structures. At Stanley Black & Decker, for example, the CFO is working with the company’s chief operating officer to orchestrate implementation of just such a structure. And Boston Scientific’s CFO, similarly, has recognized that integrated business services (called BSC Global Business Services) constitute a strategic asset with the potential to strengthen the company’s future growth trajectory. Global shared services give an organization's stakeholders more consistent access to a wide range of services. 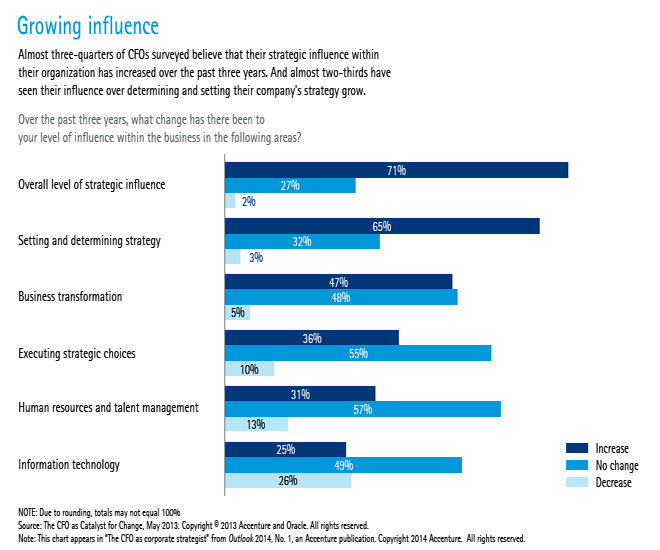 CFOs worldwide are clearly strengthening their overall strategic influence. In fact, financial skills are becoming an essential prerequisite for leadership of the company. Third-party research1 shows that the hiring of CEOs with financial experience grew dramatically over the past 12 months: 23.5 percent of CEOs now hail from financial backgrounds, compared with just 13.2 percent in 2012. And recent high-profile examples of CFOs making the transition to CEO—Siemens and Burger King, among them—strengthen the impression that the CFO’s seat at the C-suite table is secure, central and increasingly critical to business success. The CFO’s challenge going forward will be to drive revenue growth, not just profitability. And that will require a bolder, less risk-averse approach to strategic transformation than many are accustomed to. Leading CFOs, however, are already developing the enhanced skills they need to power such growth, as well as the experience to lead it. Their core skills helped save their companies from obsolescence during the downturn, and many of these same skills continue to support corporate cost structures lean and flexible enough to survive another one. Moreover, by leveraging sophisticated analytics to gain the deep insights they need to identify truly profitable growth opportunities, and by taking a pivotal position in building the globally integrated business service structures that will give them the agility to seize them, these leaders are starting to prove their worth as catalysts of transformational change. Accenture and Oracle cosponsored a survey conducted by Longitude Research to examine the changing role of the CFO. Some 930 CFOs from a broad range of industries in Asia, Europe, Latin America, the Middle East, Africa and North America were surveyed online between December 2012 and January 2013. Half of the respondents represented companies with annual revenues in excess of $1 billion, and the remainder came from organizations with revenues of more than $250 million. To augment the findings, Longitude Research also conducted a series of in-depth, one-on-one interviews with CFOs from leading organizations in every major geographic region. Donniel Schulman, a managing director within Accenture Strategy, leads the company’s Finance & Enterprise Performance group. He is based in New York. David Axson is a managing director within Accenture Strategy. He is based in Cleveland, Ohio.